Looking for an alternative to carving pumpkins this halloween? 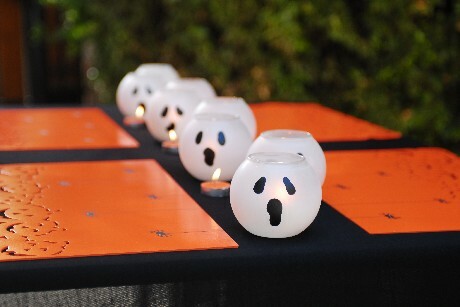 Try to make these Halloween luminaries from Krylon instead! Using paints and craft pens these ghostly luminaries can come to life. Begin spraying several light coats of Frosted Glass Finish on the lip of each votive. This area is the opening of the votive that will be resting on the newspaper. It is not necessary to saturate the lip as the idea is to create a “disappearing” gradation of white to add to the ghostly illusion. Let dry completely. Spray several light coats of Bright White on the bottoms of the votives until coverage is solid while concentrating on blending the white seamlessly with the frosted glass. Let dry completely. Spray entire exterior of all the vases with Glowz so that when your votives are not lit, they will still glow-in-the-dark, welcoming dusk. Let dry completely. Finally, freehand facial features (eyes and mouths) with a Black Paint Pen to give each ghost a personality!